During either player’s turn, you can activate “Magical Musket” Spell/Trap Cards from your hand. If a Spell/Trap Card is activated in this card’s column: You can discard 1 “Magical Musket” card; draw 2 cards. You can only use this effect of “Magical Musketeer Kidbrave” once per turn. Magical Musketeer week on Pojo.com, and we get things started with Magicial Musketeer Kidbrave. All MM monsters inherit the awesome ability to activate archetype-specific spells/traps from their hand during either players turn, we won’t need to go through that. Column-based strategy, Kidbrave will get you a draw of 2 for a discard of a Magical Musket card if you activate a spell/trap in his column. In total this is likely to be an even break (1 card to activate, 1 discard, draw 2), but as long as you break even or better than the effect is good when it comes to drawing. LIGHT and Fiend support behind a decent attacker, Kidbrave is going to get you the start of your draw power. There are plenty of spell/trap options in the archetype to power up Kidbrave, as well as the classic Honest play available to all MM monsters. Kidbrave is a Destiny Draw for the deck and should be one of the first plays you are making, especially if you go first. 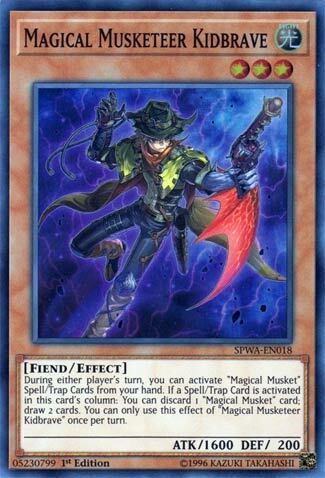 We are doing a Magical Musketeer week this week, as chosen by King of Lullaby, and the first card we will look at this week is Magical Musketeer Kidbrave. All of the Magical Musket Monsters have the clause where they let you use Spells/Traps of the archetype from the hand, so I will name this the Magical Musket Clause for remaining reviews. Kidbrave on his own lets you ditch a Magical Musket card to draw two when a Spell/Trap of any sort is used. That is a hard once per turn. Any deck getting access to Destiny Draw is great, because Draw Power is always great. Kidbrave can also trigger on both players turns if you use something like Toon Table of Contents or Upstart Goblin on your turn, then a Magical Musket Spell/Trap on the opponent’s, maximizing your drawing and helping you keep cards you want and get rid of what you don’t need, especially for Magical Musket Spell/Traps you used that turn, or get extra copies of monsters in the grave, especially for the case if you run Calamity. Every deck should have draw power and this deck does, and it is a good piece of draw power. Play it, especially since the deck loves playing Ties of the Brethern. Apologies for my recent absence, but I find myself back, at least for this week. First off, these cards have some awesome artwork. This card is a fair attacker (at 1600) and can really shine with its Draw effect. By playing a Magic/Trap card in the card this column is in, you can discard one from the family of these, to Draw two cards. This is only once per turn, but there are benefits and ways to further your advantage here. It can be beneficial for this Deck to be dumping cards to the Graveyard, and you can always use a Magic/Trap card that lets you Draw in addition to the effect of Kidbrave itself. Oh, and plus he’s a Light-Fiend mix, which use to be rare, but it still cool, and only adds to the support and power of the Deck.